You may or may not know that I haven’t always been Copyblogger’s editor. For many years, I was a Copyblogger reader. I didn’t know Brian. I didn’t know Sonia. But I pretended that I did. Of course I didn’t tell anyone that … I just received so much guidance from Copyblogger that helped me position my writing and editing services for success that it felt like I knew them. Although it was just a website with content I read, Copyblogger supported my business journey. I’m bringing this up today because I’m happy to pay it forward, if you will, and share a list of Copyblogger’s top 30 tips that help you become an in-demand freelance writer. The overhead to work as a freelance writer in the digital space is quite small compared to a brick-and-mortar business. If you’re like me, you’ll also need a lot of Moleskine notebooks for ideas and drafting. But see? Nothing too complicated. It’s fun and exciting to think about all the projects you have planned for your business. But one of the most important skills you can build is the ability to focus on your current work and short-term goals that keep the current incarnation of your writing services running. You don’t have to forget about your ambitions; you just have to prioritize your time properly. That could look something like spending 90 percent of your time on your immediate responsibilities and 10 percent of your time working on that Next Big Project. Because, remember, you’ll never get to your long-term goals if you don’t meet your short-term ones. Once you’ve got a handle on your short-term and long-term goals, select an order for the tasks you need to accomplish. What marketing projects will help you get your first clients? If something sounds like a good idea, but you don’t have the time or budget for it yet, it’s a distraction from actually making money sooner rather than later. During this process, you’ll narrow down your short-term and long-term goals even more. Swiftly move distractions to your “possibility list for the future,” when you’re in a better position to take them on. People often have a difficult time understanding how you make a living as a writer. However, some might assume you write fiction. Perhaps they ask if you work in entertainment. That one is somewhat easy to grasp. So, when you say that’s not the type of writing you do, confusion sets in — along with the notion that you probably just write as a hobby. Amateurs don’t excel at good, strategic writing, and that’s what sets you apart. You think in terms of using your communication skills to help others clearly convey their messages. Many people don’t know where to begin when it comes to translating ideas in their minds into cohesive sentences and paragraphs. Your professional writing services can become the answer to their needs. Accordingly, you have to set your prices with confidence. And it doesn’t have to be an overwhelming process, either. Learn the basics in 5 Stress-Free Steps for Pricing Your Services. Proof that supports your professional rates is a win-win. You’ll communicate your dedication to your clients, so that you don’t feel like a sleazy marketer, and your clients will get a clear picture of what it’s like to do business with you. A combination of content marketing and copywriting helps you achieve this one. More on both of those in upcoming tips. As a premium service provider, you won’t be able to accept every project someone proposes. You have to be a good match for the job, and the work has to be a good match for you. Gathering information about a project helps you decide if it’s the right fit for your business and also allows you to tailor your service — before a client has given you any money — in a way that justifies the rate you’ll charge in exchange for your exceptional work. You’ll convey that you’re highly focused on your client’s business goals — and that you may have even given those goals more consideration than he has. Does the client have a budget for this project? If so, what is it? What’s the client’s business goal? How does this project fit into the client’s marketing strategy? Does the client intend to make any alterations to the completed project (i.e., edits to the text)? Or, is there any subsequent work the client or other service providers will perform related to this project (i.e., formatting, graphic design)? Is this a project that could lead to regular work (daily, weekly, monthly), or is this a one-time task? After you’ve evaluated a project, outline what you will produce if the prospect chooses to hire you. And, most importantly, provide details about how your services will help them achieve what they want. When you present the benefits of your offer as well, you provide the information your prospect initially requested and potentially even spark excitement about your collaboration. If your client gives you a specific deadline, give yourself one that is even earlier than theirs. The earlier the better — it gives you time to handle unexpected events that may arise in your business or life and still keep the promise you made to your client. If your client is vague about a deadline, set a precise one for them based on the information you gather about their project. Then tell your client when the project will be completed and meet (or beat) the deadline. Just as setting your prices doesn’t have to be stressful, having a terms of service and payment policy doesn’t have to be intimidating. You could think of them as a “comprehensive frequently asked questions form” that your clients must review and agree to before working with you. Some aspects will be standard for all clients and some you’ll customize each time. Once a client agrees in writing, you have a work contract you can reference if confusion arises. When you draft your first terms of service and payment policy, you don’t have to cover every possible scenario that could develop. Your business and future clients will both benefit from these types of revisions. All of the tips above cover business logistics, which are necessary for a sustainable writing career. But let’s not forget that you’re an artist. Since 2006, Copyblogger has existed in the intersection of persuasion (copywriting) and online community (blogging). Words that drive specific actions can transform blog posts, podcast episodes, and videos into business assets — for both your own business and your clients’ businesses. When you master your own marketing voice, it demonstrates to clients that you can help them with theirs. Tomorrow on Copyblogger, you’ll get a tutorial on how to help your clients find their writing voices. Pinpointing your ideal client is the first step to attracting that type of company. When freelance writers don’t specify who they want to work with, they often end up taking low-paying jobs or unfulfilling assignments. But the real danger in that is believing that low-paying jobs or unfulfilling assignments are the only options for freelance writers. If you want to work for companies with substantial budgets for creative work, you must speak to them directly in your marketing materials and appeal to their sensibilities. Strong writers make great content marketers because clear communication is essential when you deliver a company’s message. Content marketing strategy helps you meet prospects where they are and guide them to where they want to go — all while positioning your business as the only reasonable choice for their needs. Your own website that demonstrates your expertise and builds trust is the best place to show prospects what you have to offer them. Sought-after freelance writers build their own audiences of prospects by consistently producing valuable content. Making progress on content projects for your own business while you work on client assignments is a smart idea. Treat yourself like one of your clients and add recurring tasks to your schedule for marketing activities, such as producing an ebook or creating blog posts and podcast episodes. Freelance writers who have overcome feast-and-famine periods know that you can’t ever put promoting your services on the back burner. One way to attract new prospects to your business is to write articles for publications your ideal clients read. Prepare a landing page for new visitors to your site, so you give them a proper welcome to your content hub. Most writing services are going to look the same to prospects who need to hire a freelance writer. It’s your job to communicate the unique qualities you bring to the table. Let’s look at an example from the mattress industry. It’s difficult to find the right mattress — and most brands look roughly the same — so a mattress shopper might not know how to narrow down their choices. The ad below (with more than 100 million views) for the Purple mattress brand uses multiple time-tested copywriting techniques — such as problem, agitate, solve — to stand out as a top option. And don’t forget that a copywriter was paid to write the script for this video. What type of positive transformation do you provide? You want to make it clear that your writing services don’t just provide words on a page for clients — you get results for their businesses. If the work you do for a client makes them a profit that exceeds the cost of paying you, everyone wins. You get paid what you’re worth and they are happy to pay high rates for your services. 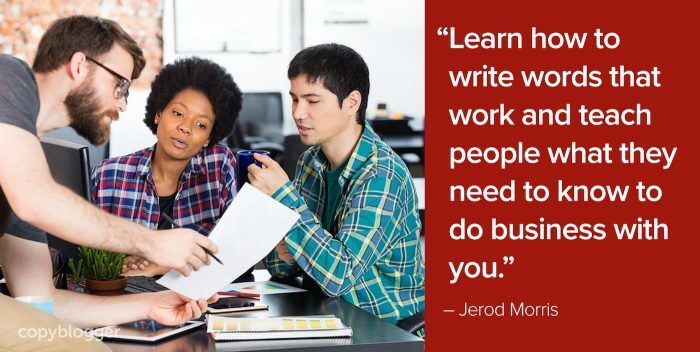 Copyblogger’s Certification program teaches you how to be the kind of writer that businesses value. If you’re interested in joining our list of Certified Content Marketers who we recommend to businesses, make sure to sign up for the waitlist at the end of this post. You’ll be the first to know when the program reopens to new students soon. Keeping an immaculate inbox helps you respond to prospects in a timely manner. Use folders or labels to keep track of different types of inquiries, so you can easily reference them in the future. Also, decide on the best times for you to send important emails. Freelance writers commonly blur the lines of their professional and personal time, which can lead to overwhelm and burnout. When you treat your writing services as a business, you have set time for work and set time for leisure, just like an employee of a company has. You’re an employee of your own company, so put procedures in place that help you manage your time, such as outlining your activities during a typical workday and crafting templates that help you answer frequently asked questions. This one will save you a lot of time and effort. Rather than trying to convince someone that they need to hire a copywriter or content marketer, speak directly to someone already looking to hire a copywriter or content marketer. Your content’s job is to educate prospects on topics they’re interested in while showing them that you are the right person to hire if they could use extra help. Here’s another win-win for both your business and your prospects. When you’re a subject matter expert or you specialize in a type of writing, you’ll have an easier time marketing your business and prospects will immediately get a clear picture of the services you offer. 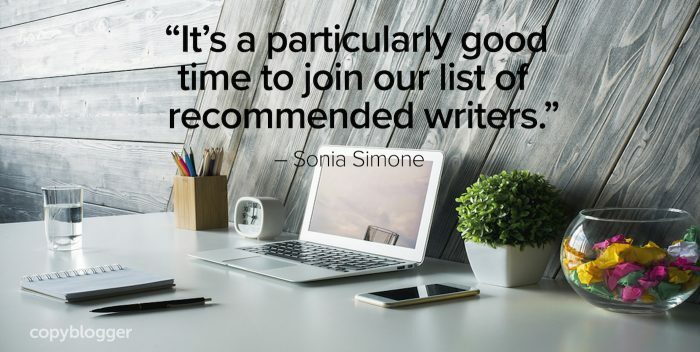 Publications you pitch articles to could also be thought of as “prospects.” Your expertise makes you more valuable to a publication looking for the best advice for its readers. Don’t listen to people who say freelance writing didn’t work out for them and the negative things they might have to say about it. If it wasn’t the right fit for them, it doesn’t mean pursuing freelance writing is a bad choice for you. There are so many factors about their situations that you don’t know, including their approach to business and their training (or lack thereof). Only you know what you’re meant to do. Once you’ve filtered out criticism that isn’t constructive, find those who support you. Your favorite websites likely have online communities you can join, or you can browse professional groups on social platforms like Facebook and LinkedIn. In-person meetups and conferences can help you grow your digital business. Live events are full of potential customers and collaborators. Your first year (or first few years) as a freelance writer might not turn out exactly as you planned. In fact, it probably won’t. Welcome to being a freelance writer. It’s perfectly natural to make mistakes on your business journey. Successful freelance writers adjust their goals, learn new skills, and move forward. If you’re feeling stuck, you can always go back to tip #1 and then outline what you want to accomplish in the next year. The Copyblogger Certification program exists to reward good writers with more clients, more revenue, more stability, and more respect. 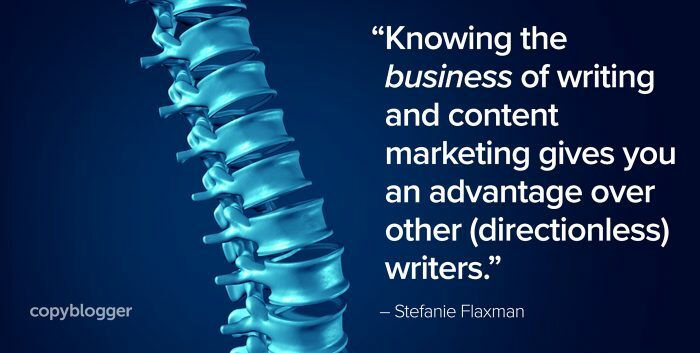 Stefanie Flaxman is Rainmaker Digital’s Editor-in-Chief.